BetOnline is a popular online sportsbooks and poker room that now accepts bitcoin. BetOnline welcomes U.S. players and are licensed and regulated in Panama. The minimum deposit and withdrawal amount is $20 worth of bitcoin. There are no charges to deposit/withdraw using either Litecoin or Bitcoin. Anonymous accounts are not available. Your name, email and address are required. 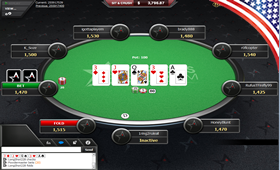 BetOnline is a high-traffic poker site offering cash games, Sit & Go's and tournaments. 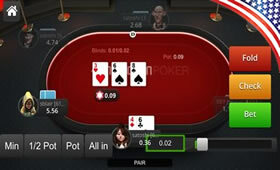 BetOnline poker is now available on Android, iPhone, Windows Phone & iPad. BetOnline offer excellent bonuses and rewared for both new and existing players. Even though they have been one of the most popular U.S. friendly sportsbooks for over a decade, it is only in recent years that BetOnline’s cardroom has surged in popularity. Its growth as a cardroom has also been helped by its acceptance of U. S. players, as well as its catering for the ever-growing group of bitcoin users looking for cheap and hassle free banking. At BetOnline, your bitcoin deposit is instantly converted to dollars so crypto and regular currency players share the same tables, meaning that player traffic is significantly higher than at bitcoin-only poker rooms like Nitrogen Poker. Cash games, sit & go’s and tournaments are always in action, and with buy-ins starting from as low as $0.05 USD it is not hard to see why. No limit, fixed limit and pot limit games are on offer, as well as Omaha – a dynamic variation of Hold ‘em where players are dealt four hole cards instead of two. 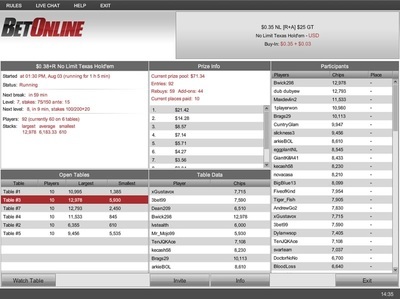 Dozens of different tournaments run each day (turbos, 4-max, 6-max, full ring, freezeouts), the most popular of which are the freerolls where players compete for free money! 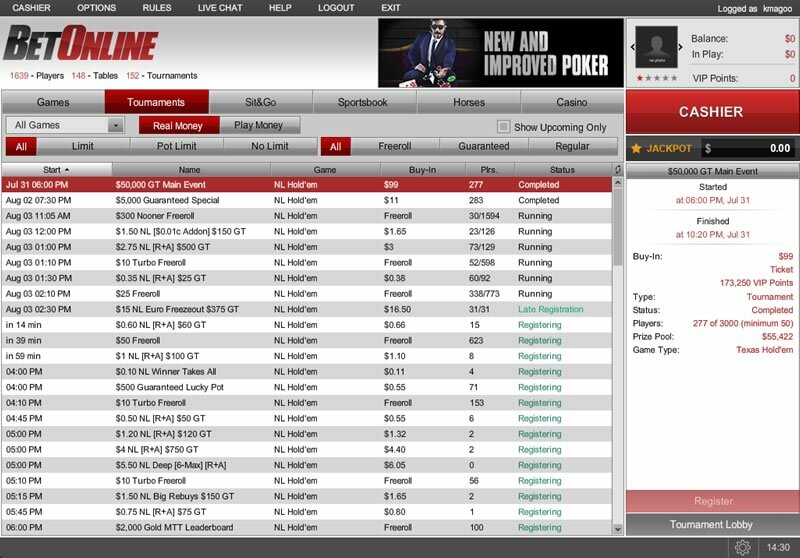 The team at BetOnline recently invested a lot of time into renovating their poker client, and it has paid off. 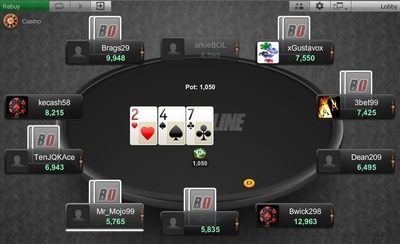 The lobby is clearly presented with different tabs for each poker format, and the table display is fully customisable: choose from various detailed themes, make use of the 4-colour deck and toggle sound effects if you want to be notified of any action if you are multitasking. 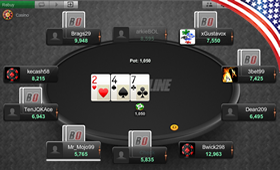 Multi-tabling is supported for those who can’t stand waiting around for a hand, and you can chat to players at your table using the in-game chat feature. Other great aspects of BetOnline’s poker client include the saving of hand histories, allowing you to look back at hands you’ve played and hone your strategy. 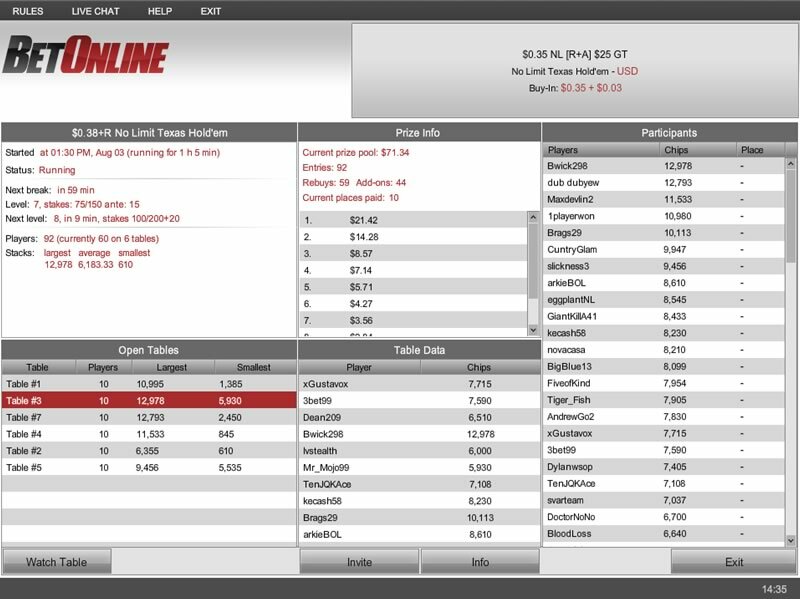 Your session stats are also recorded (including details on your betting and folding patterns) so you can learn more about your own poker game. 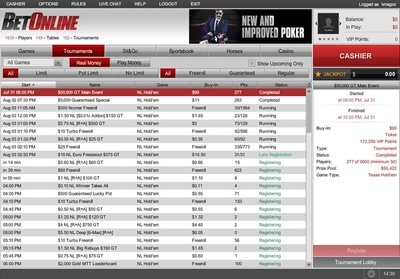 Before taking the poker world by storm, BetOnline was originally a bookmaker and it continues to offer these services. There are a broad range of markets available to bet on, and uniquely there is a ‘racebook’ provided which is a specific category for those interested in horse races. You can also bring the casino to your home with live Blackjack, Baccarat and Roulette games running 24/7. 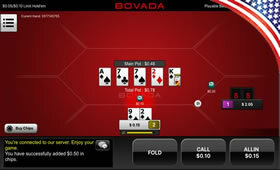 BetOnline Poker can be played on any type of Android or iOS mobile device. Play ring games, tournaments and speed poker on any smartphone or tablet. 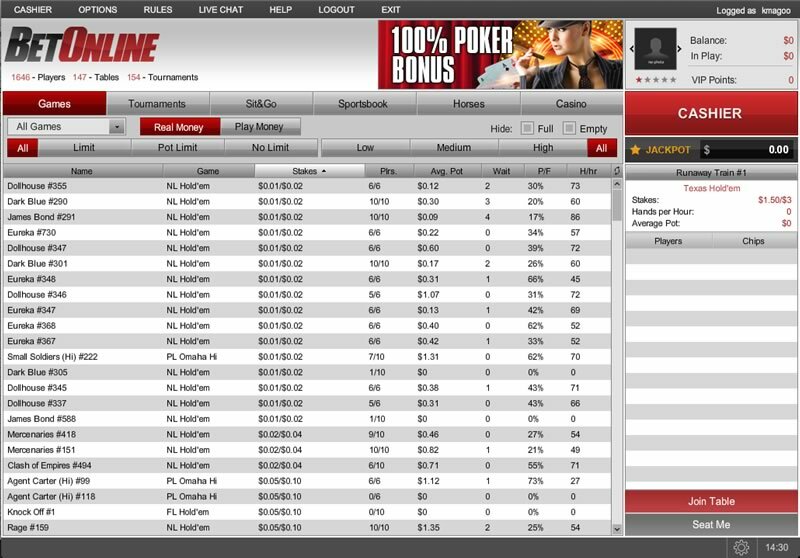 BetOnline is currency the most advanced mobile poker room because it offers identical features to their Mac and PC client. To register you will need to submit a valid email address, your full name, residential address and contact number. This procedure requires 6 confirmations and should take no longer than 1 hour to be completed. The minimum deposit/withdrawal amount is $20 with a maximum limit of $3,500 USD. Banking with bitcoin/litcoin is totally free. 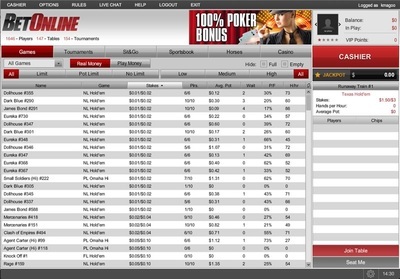 BetOnline gives out some of the biggest bonuses in online poker. New registrants will receive a 100% deposit bonus, while existing players continue to receive a 25% bonus each time they make a qualifying deposit. Earn POP points simply by playing at the tables; win 1 point for every 10 cents you pay in rake, and use them to gain entry into exclusive tournaments. There are also weekly rake leaderboards for cash games and sit & go’s – make it to the top to win your share of a $5,000 USD prize pool each week. Unfortunately "Live Chat" is not available but their support staff are available 24 hours a day, 7 days a week to answer your queries by email or phone. ​BetOnline does not currently use Two-Factor Authentication. It is clear why BetOnline is quickly becoming one of the top sites for real money players from the United States. The new poker client is a huge improvement, tables are busy 24/7, there is a wide variety of games on offer and lots of generous bonuses to reward new and existing players.